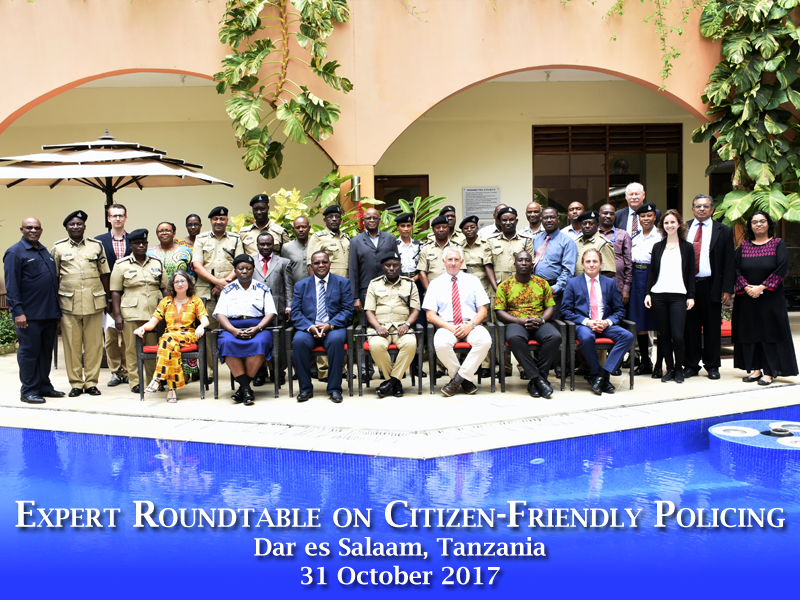 Commonwealth Human Rights Initiative (CHRI), with support from Hanns Seidel Foundation Tanzania Office (HSF), organised an Expert Roundtable on Citizen-Friendly Policing in Tanzania on October 31, 2017 at New Africa Hotel in Dar es Salaam, Tanzania. Initiating the event, Deputy Commissioner of Police Maulid Mabakila stressed the importance of change in attitudes and practices towards more community-oriented policing. In her opening remarks, Julia Berger, HSF Regional Representative in Tanzania and Uganda, identified citizen-friendly policing as a priority for HSF and the framework’s particular relevance to Tanzanian context. CHRI’s Uladzimir Dzenisevich expressed his hope that the Expert Roundtable will become the first step in a continuous dialogue between the Tanzania Police Force (TPF) and the expert community, a sentiment reiterated by experts and participants throughout the event. The event attracted more than thirty TPF officers of all ranks and six experts from six different countries. The experts included Mr. Bernhard Egger, Senior Chief Superintendent (Head of Department, Head CID) from Bavarian Police; Mr. Simon Martin, UK, and international law enforcement consultant with more than thirty years of experience in Her Majesty’s Inspectorate Constabulary and four years as UK Police Adviser to the Police Reforms Implementation Committee in Kenya; Mr. Gideon Neequaye, programme officer from CHRI Ghana Office; Dr. George Hadrian Kainja, Commissioner of Police (Research Planning and Reforms) from Malawi Police Service; Mr. Jacob Punnoose, retired State Police Chief from Kerala, India; and Dr. Kevin Mandopi, Commissioner from the Commission for Human Rights and Good Governance (Tanzania). Experts’ presentations excited much interest among TPF participants and led to two lively and prolific discussion sessions. Questions from TPF officers to experts concerned the most pertinent areas of establishing and sustaining citizen-friendly policing: how police forces in experts’ countries of origin dealt with lack of trust and cooperation from the community; how they overcame politicisation, brutality and corruption; how to involve the youth in prevention and combating of crime. Community policing was agreed to provide best solutions to tackle these challenges, and TPF representatives expressed a desire for further engagements and expertise sharing with experts and organisers.